Gum swelling is common. It may involve one or many of the triangle-shaped areas of gum between teeth. 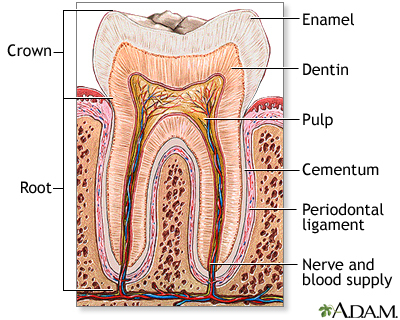 These sections are called papillae. Occasionally, the gums swell enough to block the teeth completely. Eat a well-balanced diet that includes fruits and vegetables. Avoid sugary foods and drinks. Avoid foods such as popcorn and chips that can lodge under the gums and cause swelling. Avoid things that can irritate your gums such as mouthwashes, alcohol, and tobacco. Change your toothpaste brand and stop using mouthwashes if sensitivity to these dental products is causing your swollen gums. Brush and floss your teeth regularly. See a periodontist or dentist at least every 6 months. If your swollen gums are caused by a reaction to a drug, talk to your health care provider about changing the type of medicine you use. Never stop taking a medicine without first talking to your provider. Call your provider if changes to your gums last longer than 2 weeks. How long has the problem been going on, and has it changed over time? How often do you brush your teeth and what kind of toothbrush do you use? Do you use any other oral care products? When was the last time you had a professional cleaning? Have there been any changes to your diet? Do you take vitamins? Have you changed your oral home care recently, such as type of toothpaste or mouthwash you use? Do you have any other symptoms such as breath odor, sore throat, or pain? You may have blood tests such as such as a CBC (complete blood count) or blood differential. Your dentist or hygienist will show you how to care for your teeth and gums. Ball JW, Dains JE, Flynn JA, Solomon BS, Stewart RW. Ear, nose, and throat. In: Ball JW, Dains JE, Flynn JA, Solomon BS, Stewart RW, eds. Seidel's Guide to Physical Examination. 9th ed. St Louis, MO: Elsevier; 2019:chap 13. 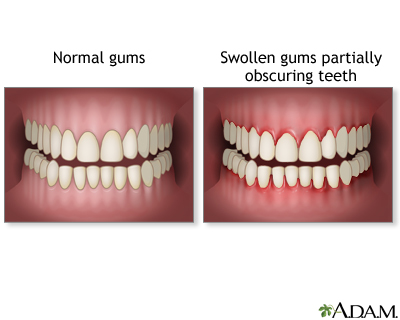 Abnormally enlarged, bulging, protruding, or swollen gums are a possible indication of disease.